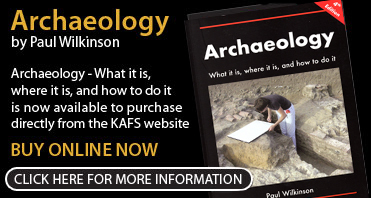 Welcome To The Official Kent Archaeological Field School Website. Welcome to our official site. 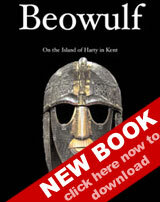 Please take a look around to learn more about the Kent Archaeological Field School and all it has to offer. The school is based in Faversham and offers a range of Archaeological subjects taught by the very best practitioners. Please look around the site to find out all about us and then get in touch if you want to find out more. Please feel also free to contact us directly using our online form. information on the new 2019 courses. Our courses for 2019 are now live on our site and are booking now. Please ensure to register your interest early to avoid disappointment! We have a number of courses available throughout the year - all of which promise to be an insightful study into the world of archaeology, whether you are a professional in the field or simply interested. Click on the link on the menu of the image above to find out more details. 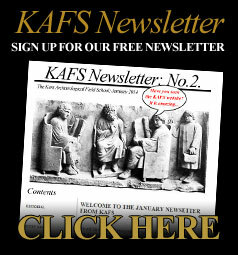 Have you seen the KAFS Newsletter? and archaeological visits both in the UK and abroad.